Previously Sudan was administered by Egypt and Britain. Political instability in the country led to weakening of Egyptian and Britain powers and both countries let people of Sudan vote for their independence. After Sudan gained independence, the country, especially the territory of present-day South Sudan, was severely affected by two civil wars from 1955 to 1972. Between January 9 and 15 a national referendum was held on the territory of Sudan. The main question was whether South Sudan should gain independence from Sudan. 98.83% of population voted for independence. 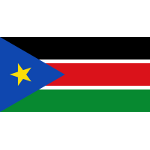 South Sudan formally gained its independence from Sudan on July 9. Although South Sudan is a new independent country, it still has disputes with Sudan, that concern oil revenues. About 75% of former Sudan's revenues are now in South Sudan.